As I mentioned in the review for 'Pink Noise Motel', there's something weird going on in the Greek music scene. Bands are experimenting a lot and take aggression, frustration and anger to new extremes. It reminded me of the rise of the punk scene in England. After listening to the album a few time, several questions came to mind. 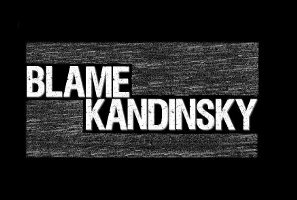 So I sent an e-mail to Blame Kandinsky with those exact questions. A short while later I got my answers. These fierce Greeks actually seem to be very nice guys with a good sense of humour. Kandinsky was a Russian painter, often credited with making one of the first true abstract paintings. Does the band name come from him or from anything else? Yes you‘re right, our name comes from him! And if he is, why exactly is he to blame? Actually, we blame him for nothing at all. He just offered us an awesome name! Don’t you think? Haha! Was math-core your first choice or is it just a term to express the chaos, frustration and anger in your country? I wouldn’t say math-core was a choice right from the start. You can’t really decide what you are going to play, if you know what I mean. We act as impulsive guys and this is the result. It’s aggressive and definitely suits lot to our feelings and thoughts for what’s going on in our country and in the world. Math-core or extreme rock… it’s all the same to us. We don’t need to categorize it! 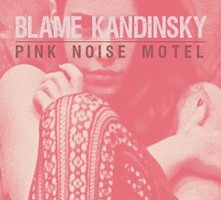 How does a math-core song starts out and how does it evolve into the tracks on Pink Noise Motel? Usually starts from some guitar riffs and then the whole band comes to develop the idea until it’s done. Each of us has his own aspect about how a song should go and how it should end. We always try all the possible ways for their growth and we jam on every idea we have on the table. We sometimes change whole parts after two or three months of playing a song in its complete form. The right way comes up after time, every time! One more about the socio-economic state of Greece and its influence on musicians. Over the past few months I’ve heard a lot of Greek releases. Each band seems to digest the situation in their own way. It reminded me of the punk-scene in England several years ago. Is it true that situations like this have a huge impact on the quality of music? Definitely! Being a musician, it’s not a deal between technique and money to buy your gear. It is all about vulnerability and consciousness. If you live as a society activist whether all these big changes affect you or not, you have to find a way to stay unscathed, save yourself, follow your dreams and help the helpless. If you have something to say, say it but then…act. 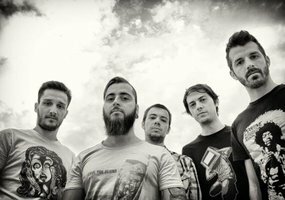 Thankfully most Greek bands act against this situation through their music as you rightly mentioned it in your question. Math-core is a very complicated and violent genre. I can’t really imagine all band members listening to this genre full-time. So what do you like to listen to when you relax? We all listen to very different kind of stuff ranging from Frank Zappa and Pink Floyd to Red Snapper and Kasabian, from Misfits and Jean Michel Jarre to City and Colour and Four Tet. You could consider some post rock, hip hop and electro for sure!! And, what’s on the radio when you are on the road? Hmm… It depends on our mood I think… maybe Elvis Presley on sunny days and Blame Kandinsky on darker days? I ‘m kiddin’! It depends. Sometimes there is no music while we are driving! I can imagine your concerts being intense. Can you say anything about performing live? Performing live is mostly our favorite thing to do! All the craziness on the show comes out spontaneously. We feel grateful for everyone who stands in front of our stage during our gig and we hope that we pass our energy out to everyone! We would like to see people acting crazy and join us on stage, sharing the mic, do what they want to do! It’s kind of being their show, not ours. Will Pink Noise Motel be supported by a tour? Yes! We will hit the road for our first Balkan tour from April 9th to April 18th. We will visit Skopje, Serbia, Hungary (not a Balkan country, we know! ), Romania and Bulgaria. Soon we will announce the dates on our page. BEWARE! !